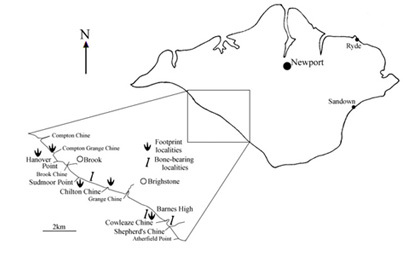 The majority of dinosaur fossils are found along the south-west coast at Hanover Point, Chilton Chine and Brighstone Bay, as shown in the map to the right. 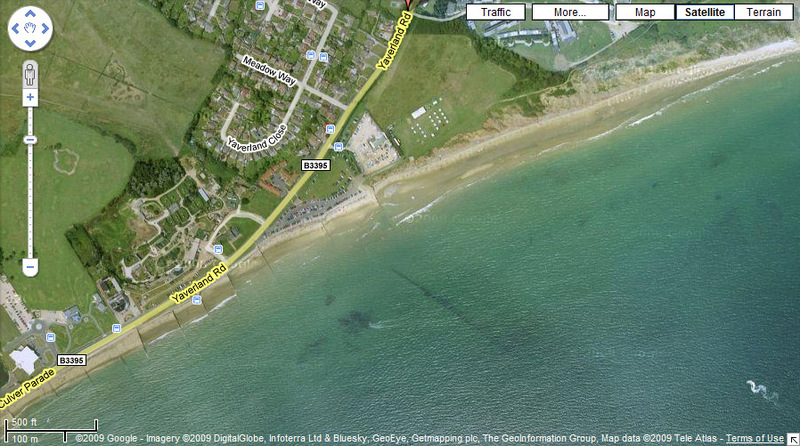 Dinosaur remains are also found at Yaverland, near Sandown. Simply click on the localities on the map or use the names below. The most well known of the localities, with both bones and footprints. This stretch of beach, from Compton Chine to Brook Chine, is easily accessed from the carparks located at either end, and is often used by surfers and footprint hunters. However, the site is protected by the National Trust, preventing removal of the rather nice, and quite large, dinosaur footprints. Some are still embedded to the source exposure, a white splay crevasse sandstone, extending from just west of Hanover Point to about 100 metres west of Brook Chine but well exposed for 15 metres at the western end, with the upper surface exposed, there is also a section of trackway in a red clay bed, 150 metres out from the cliff at Hanover Point, heading in a south-easterly direction, but are only accessable at a low tide. These are usually attributed to a theropod , but at the Dinosaur Isle museum there is literature which refers to them as iguanodontid. When it comes to bones, however, the quality is not as good. occasionally on fossil hunts with Dinosaur Farm Museum and the Fossil Shop some nice bones have be found, but most of the material, if you can find it, is small fragments, although some larger pieces have been found. Unfortunately, the best specimens are those that are preserved in the cliffs, and as none are found in such a manner here, the best thing to do if go further along the beach. How do I know if I've found a bone? A little known locality that is often missed due to the near impossible-to-find path leading from the small unmarked free carpark, which itself is obscured from view by the neighbouring Isle of Wight Pearl complex. At this locality you may find rolled bones and many small footcasts, although these are generally loose and of little stratigraphic use. Be very discriminating when collecting at this locality, as many that look like dinosaur footprints are just footprint-shaped rocks (even some experienced palaeontologists get fooled by these!). There are also some trackways on the foreshore, but these are unknown to some local palaeontologists. Between this locality and Hanover Point there can be found many rolled bits of dinosaur bone, especially at low tide, and there is a plant debris bed about 500 metres from Chilton Chine, which contains not only lignite but also the occasional bone. One of the more productive fossil beaches the majority of the dinosaurs found on the Isle of Wight have been found here, with the exception of Yaverlandia. 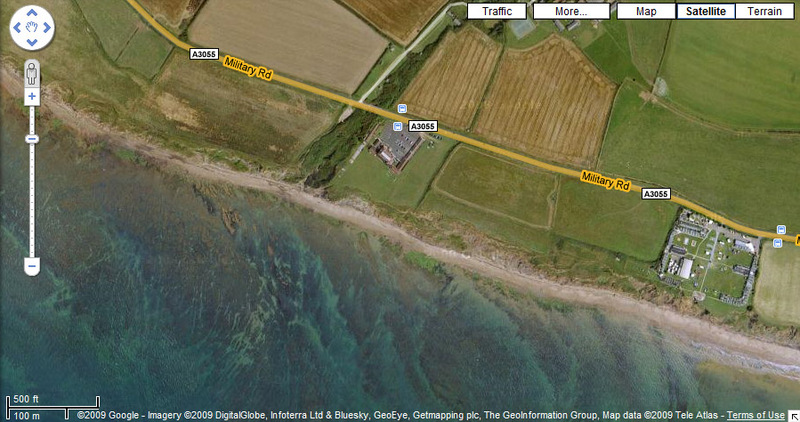 This may have something to do with it's close(ish) proximity to Brighstone Village, where the curate William Fox, the Fossiling Clergyman, used to live, so this may be due to length of study rather than actual density of fossils. Having said that, the Hypsilophodon beds are exposed here, and the Wessex Formation is exposed for most of its length, so there is plenty of exposed cliff to look at. Access to this locality is quite difficult, the only easy access being from either Shepherds Chine (opens onto the beach at SZ446799) or from the cliff path, and down the steep path at the mouth of Shepherds Chine. 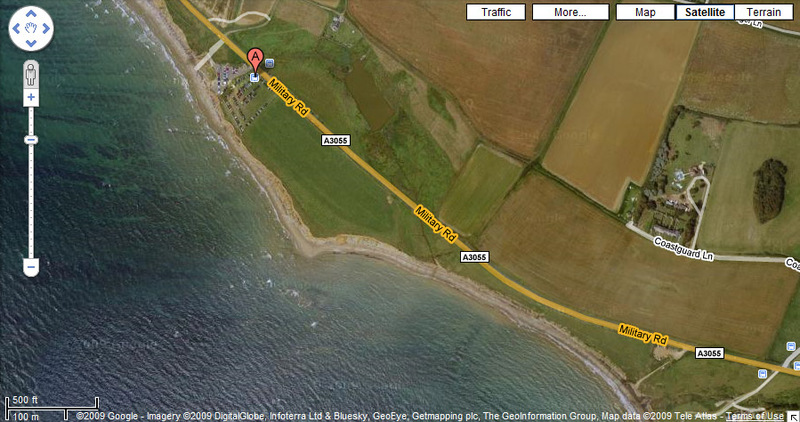 Access can also be gained from Grange Farm holiday camp, although permission is often needed. 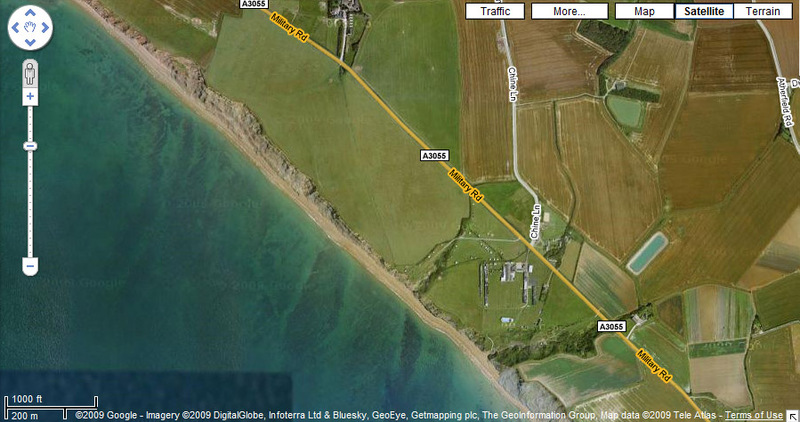 Despite this, Brighstone Bay is popular during the summer months with sunbathers and paragliders, although they very rarely venture far away from the mouth of Shepherds Chine, with the exception of the occasional naturist. In addition, as this area is popular with the local collectors, good dinosaur footcasts are rare and hard to find at this locality. Dinosaurs are also found at Yaverland, near Sandown, and the fossil hunts organised by Dinosaur Isle often come up with bits and bobs. Of course, the most famous dinosaur to come from Yaverland Point is Yaverlandia, but even this is known from only a piece of the skull, so fossils, even those of Iguanodon, are very rare here. However, dinosaur footprints tend can also be found, but are also rare, and this could be due to the easier access to the exposures at Yaverland, allowing collectors to get to them sooner.